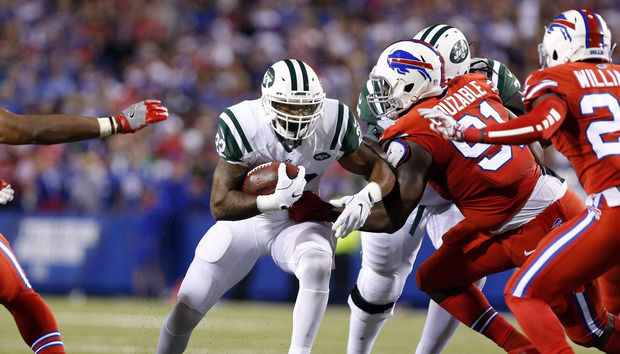 Twitter needed a win, and it got one in a big way last Thursday night when the New York Jets beat the Buffalo Bills 37 to 31. Twitter's NFL debut was a significant test for the beleaguered social media platform. The live broadcast didn't experience any major hiccups and, according to the NFL and Nielsen, 2.1 million people watched the game on Twitter. Thursday night's game was the first of 10 matchups Twitter plans to stream throughout the remainder of the season. Twitter inked the deal with the NFL in April, and it is making a concerted effort to push further into live broadcast TV with sports, news and entertainment programming. Leading up to kickoff, the company also released new apps for streaming devices, including Amazon Fire TV, Apple TV and Microsoft's Xbox One, to expand its reach. Jan Dawson, chief analyst and founder of tech research firm Jackdaw, says the Twitter stream quality "seemed fine," and the experience worked as intended. The NFL and Twitter partnership, however, still "needs a lot more work to be valuable" to NFL fans. The live stream wasn't in the primary feed on Twitter's mobile app, except for the occasional promoted tweet. Instead, it was buried inside the app's Moments tab. Mobile users had to tap at least four times to view the game in full-screen mode on their devices. The process was two steps shorter using Twitter's new apps for streaming devices. Viewers also reported delays during the game, saying Twitter's feed ran at least 30 seconds behind the live action. "One of the biggest benefits versus other ways of watching the game on one of these devices is that it just worked — there was no sign-in or authentication," Dawson says. "That may not sound like much, but it's one of the biggest barriers to over-the-top streaming of this kind of content, and eliminating that is a big deal." Twitter's NFL viewership matched the digital audience Yahoo reported when it streamed an NFL game last October, but the company hopes to draw more eyes as the season unfolds. Twitter's NFL audience also pales in comparison to the 48.1 million total people who watched the game on traditional TV, as well as the average of 15.4 million people who were watching the game at any given time, according to Nielsen. "The average audience watching Thursday Night Football on Twitter properties was 243,000 with each viewer watching an average of 22 minutes of game action," the NFL reported. A total of 2.1 million combined worldwide viewers watched Thursday's game on Twitter for a minimum of three seconds with the video 100 percent in view, according to the league. Twitter can currently stream only one game per week, which means diehard NFL fans can't rely on the social network for all games, according to Dawson. "The other challenge is that I don't think Twitter's really providing that much unique value here — the tweet stream that appeared alongside the video wasn't all that compelling, because it seemed to be largely tweets from regular people watching the game," he says. "Twitter needs to curate this feed more proactively, or even offer several options for tweets from professionals or from the viewer's own feed if this part of the experience is to become more valuable."